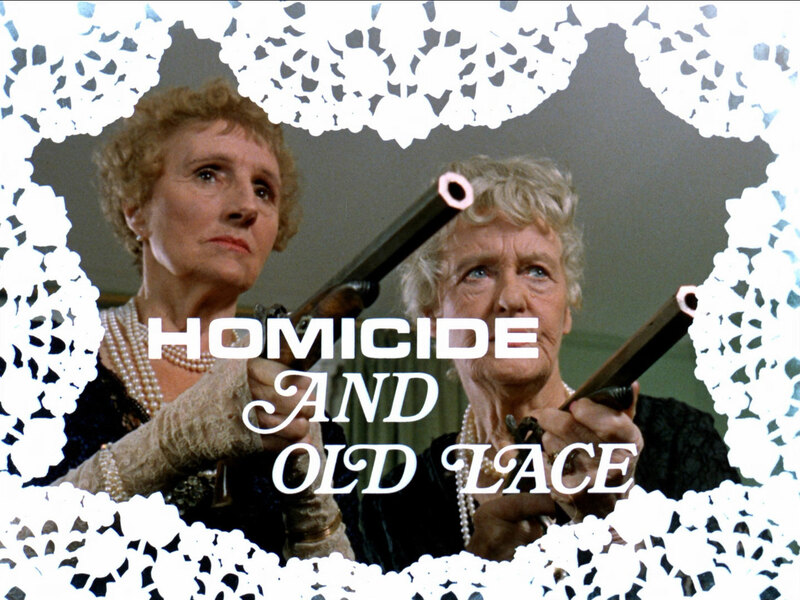 Two old ladies, Harriet (Joyce Carey) and Georgina (Mary Merrall), are excitedly lying in wait for Mother, he approaches their flat and they draw antique duelling pistols from a box! Mother (Patrick Newell) is wheeled in by Rhonda (Rhonda Parker) who pulls out two revolver with lightning speed when faced by the pistols, but Mother stops her and says his mother would never forgive him - these are his aunts. 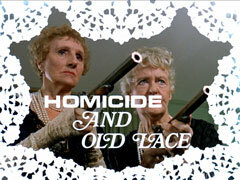 The old ladies wish him a happy birthday and tell him the pistols are their gift. He orders Rhonda to make tea, and he'll have a large whisky. His aunties are disappointed in him - not for drinking, but because he didn't ask for "five fingers of old red-eye". They read all the spy stories and ask him if he's carrying a "gat". When he refuses to chop a table in half with his bare hands, or take them on a tour of the Black Museum or morgue, they demand a true story, "torn from the annals of time, every fibre of emotion laid bare". Mother condescends to tell them about the "Great Great Britain Crime", the crime of the century. It began when an agent was lured to a nighttime rendezvous, where he was ambushed by two men. A second agent stumbled on the same trail and was gunned down at a fire post. A third agent managed to contact headquarters with the single word, "Intercrime" before being killed, and Mother alerted all agents. A man named Cartwright came forward with information but what he didn't know, and we didn't know - "was he was heading straight into an ambush", Georgina finished triumphantly. Mother, slightly perturbed, continued - Cartwright was intercepted on the road by a van out of which poured the henchmen of Fuller (Edward Brayshaw). Fuller stole Cartwright's briefcase of cash while his men shot and buried Cartwright (Donald Pickering) - but Cartwright had been wearing a bullet-proof vest and survived the attack. Cartwright climbed out of his grave and proceeded to Steed's flat where he informed them of a diamond heist worth £750,000 in Bond Street. Steed is disinterested, saying that's Scotland Yard's territory and Cartwright goes on to mention the "crime of the century" Intercrime is planning. (Harriet complains that Mother has made Tara blonde when she knows she's a brunette). Fuller crosses the floor of his control room and speaks to the fake window cleaners, Kruger (Gertan Klauber) and Rossi (Kevork Malikyan) to make sure they're ready for the job. Steed and Tara waited for the robbery to take place, then robbed the robbers when they left the jewellers, Steed leaving a calling card in the window cleaner's bucket... but the department made two mistakes. 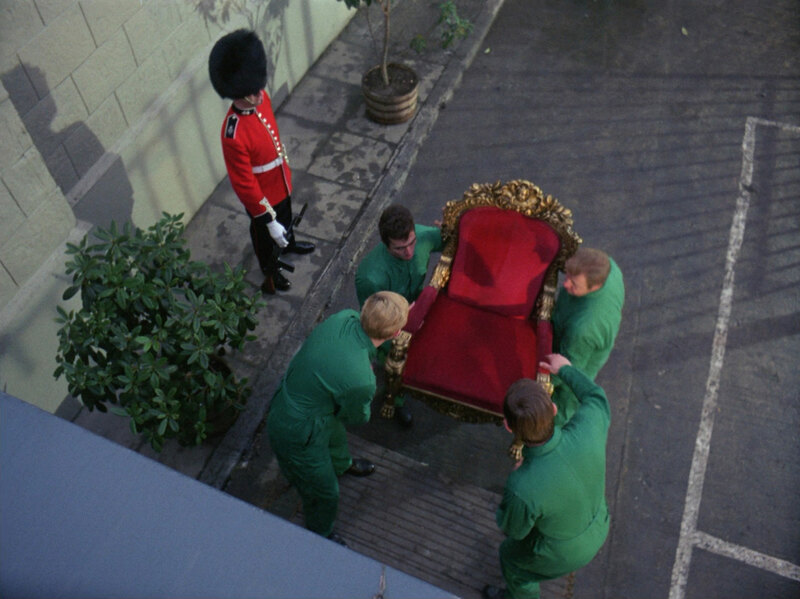 The first mistake was assuming Intercrime had a sense of humour - Fuller contacted his execution department to take out Steed, the second, Cartwright was wearing Steed's suit and was killed by the squad. Steed was then lured to some earthworks where a man attempted to bury him alive. He was then summoned to a country house where another attack was made on him. Dunbar took over from Fuller and decided they could use Steed rather than kill him - they captured Tara by cutting her off in a car park and contacted Steed. He went to catch a cab, disarmed the alighting passenger who pulled a gun on him and forced the driver (John Rapley) to take him to the address. Steed is met by one of the controllers (Ann Rutter), who takes him to see Dunbar. Dunbar says he can keep the diamonds if he successfully pulls off the crime of the century. Tara meanwhile was being interrogated by Fuller but refused to reveal anything. Dunbar gives Steed a dossier on Colonel Corf and introduces him to Dubois, who will help him break into Corf's safe - Dunbar needs Corf's telephone scrambler code to ensure a smooth operation. Steed insists on having Tara as his safecracker and she's put up against Dubois to see who could open Dunbar's safe fastest. Tara wins and she and Steed set off to see Colonel Corf (Gerald Harper) who, after waving away his aide, Armsmith (Bryan Mosley) tells them he hasn't time to conduct a tour of his secure facility. Steed ingratiates himself with a few school memories and they're soon in Corf office, 500 feet below ground. Tara pretends to feel ill and stays in Corf's office while Corf shows Steed the collection of British heritage treasures in the vaults - painting, sculpture, even the Crown Jewels - all forgeries. Tara photographs the codes and has resumed her seat by the time they return. 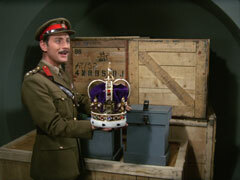 Corf concedes he doesn't know what Operation Rule Britannia means, he has no idea what he is to do with the forgeries. Georgina and Harriet are disgusted and think Corf a fool, but Mother explains that he alone knew what the operation was. Indeed, Steed visits him shortly after and was told that, in the event of war, all of Britain's treasures would be collected and replaced with the forgeries, the originals being stored in Corf's vault. 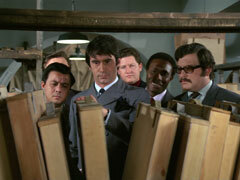 Steed realises that Intercrime know about the operation and plan to get the originals into the vault so they need only raid one target to gather all of Britain's treasures. At Intercrime, Dunbar shows the delegates the negatives of Corf's scrambler codes and he asks Osaka (Kristopher Kum) to send out his man to fix the lines. Ngushu taps into the line and Dunbar establishes a connection as Steed and Tara return. Dunbar tells Steed to convince Corf he's with the Prime Minister and the operation is to start at once. Corf is startled but opens his sealed instructions and started the ball that was Operation Rule Britannia rolling. 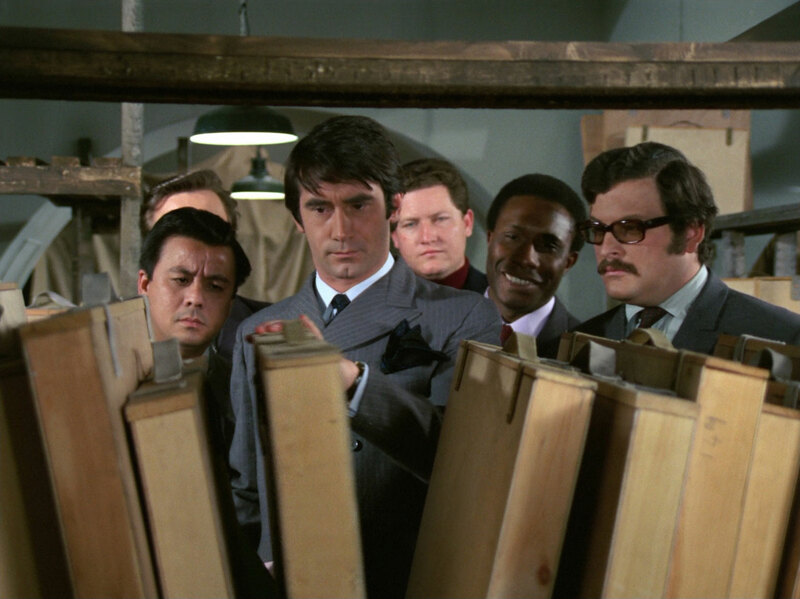 Back at Intercrime, a henchman (Denny Powell) stops Steed from making a 'phone call; Dunbar agrees he can't get into Corf's vault without Steed, but Tara is to remain a hostage, guarded by the henchman. Steed set off, accompanied by the delegates but Tara managed to escape, the henchman chasing after her with a submachine gun. Tara broke into Corf's secure area just as the last of the treasures were being delivered, and ran pel mel to catch Corf in time to warn him. 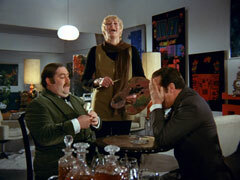 (Harriet questions how she got there before Steed). Corf is skeptical, even when Tara reopens his safe - he thinks it's a security exercise rather than a criminal act. Tara tells him to let the intruders in then seal the building. She hides in the vault while Corf, still thinking it an exercise, feebly tries to arrest the men. Dunbar disarms him and Steed tells him Tara was right while Dunbar orders his men to find Tara. Tara evades the searches, and Corf hits Fuller with his baton when he's distracted by the sound of gunfire as one of his men shoots at a departing Tara. The delegates hear the commotion and the American accuses Dunbar of a double cross. Dunbar shoots him dead and Osaka, the African delegate (Bari Johnson) and the USSR delegate (Stephen Hubay) draw their revolvers on Dunbar. Dunbar shows leadership and orders Osaka to help him check the corridors while the others check the office. Tara takes care of a few henchmen while Steed and Corf dispatch Osaka and the African. Cornered, Dunbar primes a cigarette lighter bomb and tosses it at our reunited trio. Corf catches it and bowls it back at him, blowing a hole in the wall. "Game, set and match! ", chorus a delighted Georgina and Harriet, "it all ended happily ever after!" They're slightly disappointed there wasn't a downbeat ending, so Mother tells them Steed sprained his thumb, and the shocked turned Tara brunette. 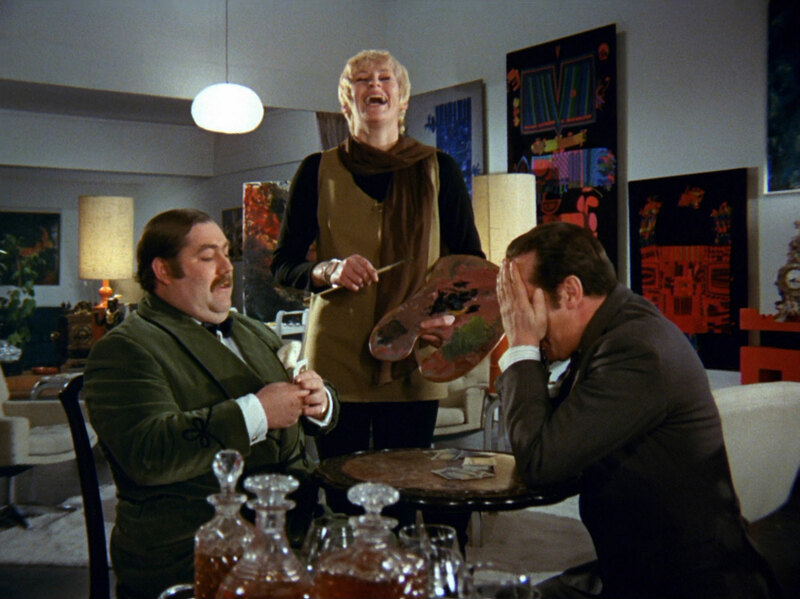 A few days later, Mother and Steed are playing cards when Steed realises he's never heard Rhonda, who's painting a picture, say a word; he concedes it bothers him unaccountably. Mother calls Rhonda over and tells her to "say hello to Mr Steed"; when she does so, it's in a strangled voice, Steed looks up in some surprise. He asks if that was her and Mother laughs, Rhonda's lost her voice and he was practicing his ventriloquism. He demonstrates again and they all laugh when Mother deliberately says, "Gottle of geer".